Mumbai: India’s current account deficit is expected to widen further on the back of higher oil prices and sharp increase in imports of bullion, machinery and electronics, the Reserve Bank of India (RBI) said on Thursday. India’s current account deficit (CAD) swelled to $14.1 billion in its fiscal first quarter, nearly triple the previous quarter’s tally. The full-year gap is expected to be around $54 billion. “Recent data indicate further widening of the trade balance. Consequently, CAD which increased during Q1 of 2011-12 is expected to widen further," the report said. The trade deficit for 2011-12 is expected to widen sharply to between $155 billion and $160 billion from $104.4 billion a year ago, posing further downside risks to the rupee, which hit a record low last week. 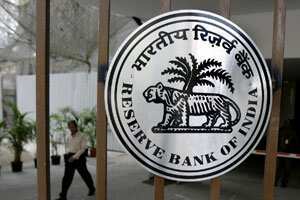 The sovereign debt problems in Europe and global slowdown were also impacting India’s growth, the RBI said. “Exports may moderate further if the slowdown in advanced economies persists," it said. The RBI said risk aversion sentiment and the depreciation of the rupee could complicate refinancing of foreign currency convertible bonds and external commercial borrowings by Indian companies. The rupee is the worst performer among its Asian peers, having lost more than 16% since July peaks, although it has bounced off record lows hit last week after the central bank took steps to prop it up. Higher government borrowings could crowd out private sector demand for funds and investment, the RBI said, adding domestic demand was showing weakness. Government data released earlier this month showed India’s industrial output fell in October for the first time in more than two years.